Kiwis love the great outdoors. Even when we’re at home we’d rather be out on the deck. But nothing quite matches the satisfaction of a deck you’ve built yourself. Find out how to build a deck right here. Knowing how to build a deck yourself is a great DIY skill to learn, and one you’ll be able to use to build a porch or build a patio as well – as they can be very similar structures. As DIY projects go, a deck may seem like an ambitious project, but taken step-by-step, building a deck is pretty straightforward. This guide will show you how to do it yourself. These instructions are for a simple, 3.6 metre by 3.6 metre deck, sitting 0.75 metres above the ground, but the same principles apply whether it’s a bigger area, or higher off the ground. With higher decks, consideration needs to be given to bracing and handrails. Usually a deck will be attached to the house on one side and this example will show you how to do that. We’ll also show you some invaluable tips and tricks that’ll help you get the job done. 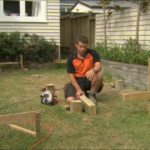 Watch the video guide “How to build a deck” now, then come in-store to Mitre 10 for everything you need to get the job done. And make sure you check out the rest of the Mitre 10 Easy As guides at https://www.mitre10.co.nz. for more projects you can do yourself. Plus, join us on Facebook at https://www.facebook.com/mitre10/and we’ll keep you up to date with news, special deals, prizes, and handy advice.